The national character of Ireland has always been closer to the Mediterranean countries, such as Italy and Greece, than the Northern European nations. The Irish are a laid-back people with a sunny disposition. We are extroverted and gentle but also very proud. Like the Italians, the Irish don’t talk, we sing, especially in the Southern parts of the island. There are also strong historical ties between the nations that go back as far as the European Dark Ages, which began around 500 AD. In his book, How the Irish Saved Civilisation, Thomas Cahill argues convincingly that much Graeco-Roman literature was preserved by Irish monks when Europe was being overrun by barbarians such as the Goths and the Huns. Much of our civilisation today is based on Greek and Roman civilisation. If those Irish monks had not copied and preserved those writings, we would be living in a different world today. A world far less evolved and enlightened. In 1608, the Irish Earls, O’Neill and O’Donnell, arrived at Rome to seek help from Pope Paul V after being forced out of Ireland by the British. They are buried in the church of San Pietro in Montorio which indicates the high esteem the Italians had for these Gaelic chieftains. 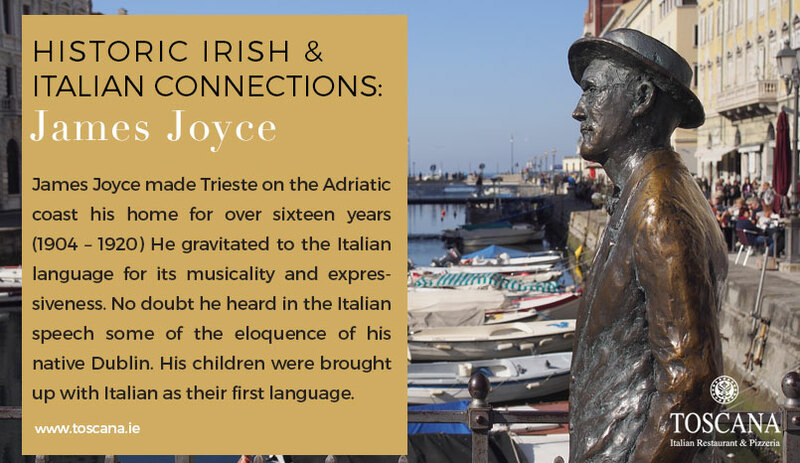 James Joyce made Trieste on the Adriatic coast his home for over sixteen years (1904 – 1920) He gravitated to the Italian language for its musicality and expressiveness. No doubt he heard in the Italian speech some of the eloquence of his native Dublin. His children were brought up with Italian as their first language. Today, Irish – Italian relations have never been stronger as both countries play a vital role in moving the EU forward, especially in these challenging times. Over a quarter of a million Italians visit Ireland each year and many Irish towns are twinned with Italian towns. Italian restaurants are popping up everywhere in Ireland. What makes Toscana’s different? Well, we bring the best in Irish and Italian food to your table: fresh organic produce from our farm in Wicklow combined with genuine Italian recipes. At Toscana’s we are proud of our Italian – Irish background and culture. What a wonderful mix it makes! An Italian Restaurant Worth Visiting! So, if you want to taste a little piece of Italy, without spending a small fortune on a holiday, come to our Italian restaurant. 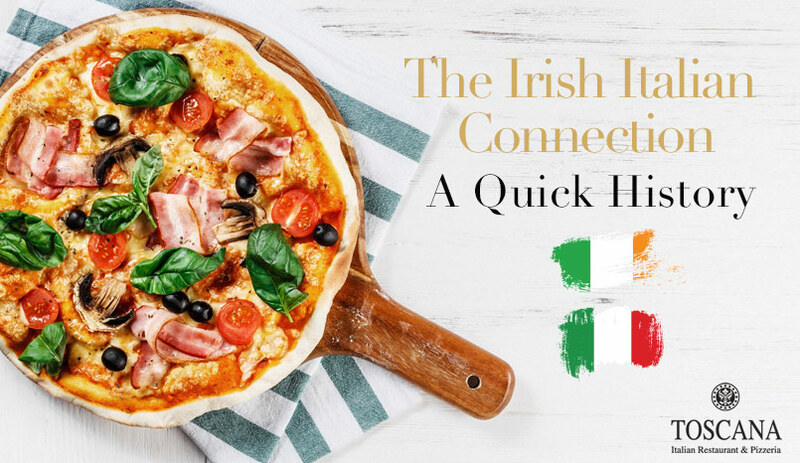 Both Irish and Italian people are famous for their hospitality, so get a double dose by visiting us here at Dun Laoghaire. 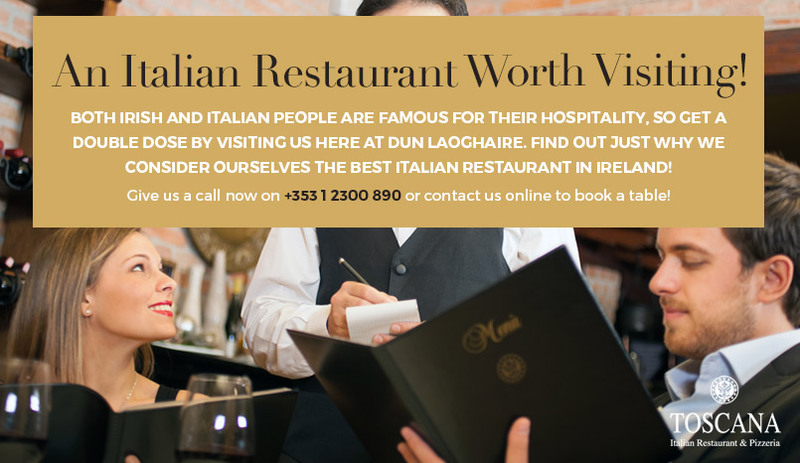 Find out just why we consider ourselves the best Italian restaurant in Ireland. Go on and book a table by calling us on +353 1 2300 890 or make a reservation online, you’ll love it!